Diamond clarity is a term used to describe the absence or presence of flaws inside or on the surface of a diamond. A perfect stone with perfect clarity, or clearness, is rare, and most flaws that do exist in jewellery grade diamonds cannot be seen without looking at the gems through a jeweller's loupe. Below are some simplified definitions of the various clarity grades set by the Gemological Institute of America (GIA). Minute (Very, Very Small) inclusions extremely difficult for a skilled observer to locate at 10x magnification. Minute inclusions very difficult for a skilled observer to locate at 10x magnification. Noticeble inclusions very easy to see at 10x magnification and perhaps visible to the unaided eye. Obvious inclusions easy visible to the unaided eye. VS1 = Very Slightly Included 1 -- very small inclusions visible with 10x magnification; slightly difficult to difficult to see under a loupe with a 10 power magnification. VS2 = Very Slightly Included 2 -- several very small inclusions visible with 10x magnification; slightly difficult to difficult to see under a loupe with a 10 power magnification. Considerations in grading the clarity of a diamond include the type of stone, point size and the location of inclusions. Inclusions that are near to, or break the surface, may weaken the diamond structurally, therefore reducing its value significantly. On the other hand, it may be possible to hide certain inclusions behind the setting of the diamond (depending on where the inclusion is located), thus minimizing any negative impact of the inclusion. A fairly common practice in the jewelry trade is grade-inflation or "grade bumping." According to the Federal Trade Commission's (FTC's) Jewelry Guides, a diamond must be within one clarity grade of its advertised amount at the time of sale. 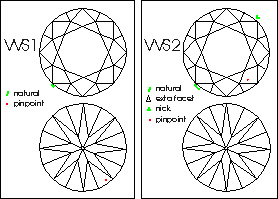 If a jeweler sells a diamond that has an actual grade of VS-1, he or she could legally sell it as a VVS-2. There are several different types of blemishes, or flaws, that you might see on the surface of a diamond. Some diamond blemishes are a natural part of the gem and others occur either when the diamond is cut and polished or while you are wearing it. Surface blemishes can affect diamond clarity and value, but many blemishes have little or no affect on a diamond's appearance. Scratches are usually fine surface lines that can be polished away, but the diamond must be removed from its setting in order to do that. 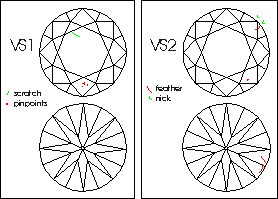 Nicks are areas where a portion of the diamond has chipped away. Small nicks are sometimes repaired by polishing them to create an extra facet. If too many extra facets are created in order to remove blemishes, they can have a negative impact on the diamond's appearance and value. Pits are holes in a diamond's facet. Some pits aren't noticeable, but a pit on the diamond's table facet is more likely to be visible and will affect the diamond's clarity grade. Shallow diamond pits can sometimes be polished away. A natural is a portion of the diamond's original rough surface that hasn't been polished. Naturals are sometimes left along a diamond's girdle if doing so allows the cutter to produce a larger carat weight stone. Naturals don't normally impact the diamond's clarity grade if they are present only on the girdle. A trigon is a natural that looks like a small triangle. A trigon sometimes looks like series of triangles within triangles. Polishing lines are markings that occur during the cutting and polishing process. Their affect on the diamond's looks and value depends on where they are. Polishing lines on the pavillion aren't as noticeable as lines in other areas. Carbon - Tiny black spots caused by undigested carbon inclusions (natts). Needles - Rutile-like needle shaped inclusions. Twinning Wisps - Inclusions resulting from crystal twining during growth. Many exterior flaws are the result of the cutting and polishing process. Abrasions - Whitish haziness along the junction of facets caused by wear. Nicks - Small chips at facet junctions. Scratches - Grinding Wheel Marks of scratches from contact with other diamonds. Burn Marks - Surface burning from heat buildup during polishing. It's important to consider where a diamond's flaw is located in relation to the stone's cut, because some flaws are more noticeable when positioned in specific areas. Since no two diamonds are alike, the flaws provide an important road map that may help us identify our property. It is important to be know that inclusions and blemishes are much more difficult to see in the actual diamond than they usually appear as drawn on the diamond plot. IF: (Internally Flawless) No inclusions, and only insignificant surface blemishes. 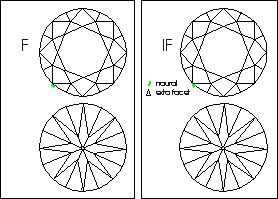 Normally, what separates IF from FL diamonds are characteristics that can be removed by very minor re-polishing. VVS1 and VVS2: (Very Very Slightly Included) Minute inclusions that are difficult for even a skilled grader to see under 10X binocular magnification. In VVS1, they are extremely difficult to see, visible only from the pavilion, or small and shallow enough to be removed easily by re-polishing. In VVS2, inclusions are still difficult to see. Typical inclusions: scattered pinpoints, taint clouds, slightly bearded girdles, internal graining, and tiny feathers, chips and bruises. VS1 and VS2: (Very Slightly Included) Minor inclusions ranging from difficult to somewhat easy for a trained grader to see when examined using 10X magnification. Typical Inclusions: small included crystals and feathers, distinct clouds, and groups of pinpoints. 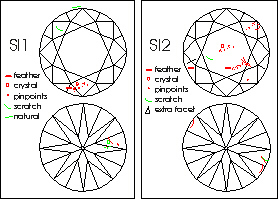 SI1 and SI2: (Slightly Included)Noticeable inclusions that are easy (SI1) or very easy (SI2) to see when examined by a trained grader using 10X magnification. Typical inclusions: small included crystals, clouds, feathers. I1,12 and I3: (Imperfect) Obvious inclusions that are often easily eye-visible face up; in I3 they may threaten durability. Typical inclusions: large included crystals and feathers.